Last year, Homes for Animal Heroes programming grew from 3 states to 9. How far can we expand in 2019? Your participation in the run helps determine the answer! Our initial goal is to raise $60,000. Together, let’s see how quickly we can get there. 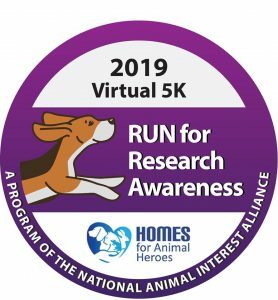 Demonstrate your love of animals and raise awareness about the importance of biomedical research by participating in the 2019 virtual 5K fundraiser. Individuals and teams across the nation are invited to pick a date—April 1 through June 30—and location on their choice via our easy-to-use fundraising platform. Race bibs and medals* are available to help unify your team and celebrate your success. 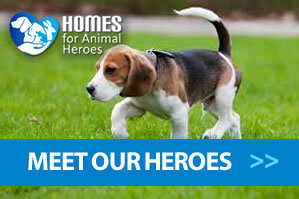 Take plenty of photos, share on social media, and tag NAIA and Homes for Animal Heroes. Get in on some friendly competition. The three team wards from previous years are back again: the team raising the most support, AALAS branch champ, and the team with the most dogs registered and participating. New in 2019, we’ve added team and individual awards based on region of the United States. Raise funds and earn prizes. ** This year’s prizes include race medals, dog tags, key chains, PopSocket cell phone holders, umbrellas, and jackets. Let your gift have double the impact. Ask your employer to match your contribution. NAIA’s tax ID is 93-1099912. 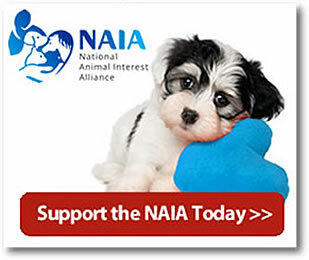 If you aren’t able to participate as a runner/fundraiser, please consider making a gift to help Homes for Animal Heroes continue the important work of rehoming dogs from research institutes across the nation. For more about the run, visit the 2019 Run for Research Awareness registration website. *Race bibs and medals are available while quantities last. Please email events@NAIAonline.org and allow two weeks for shipping. **All prizes will be mailed after the campaign ends on June 30, 2019. Please allow 4–6 weeks for delivery. Prizes for team members will be sent to team captains unless otherwise specified.